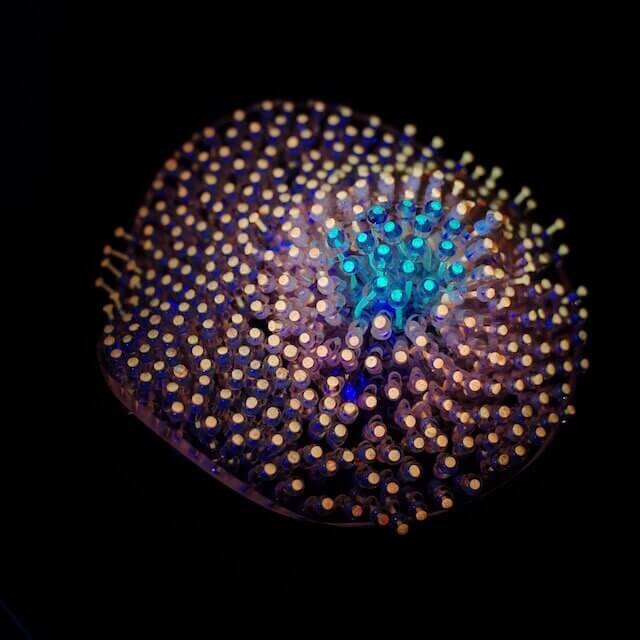 The” Go with the Glow” series brooch is light-weight, tactile, colourful and playful, with amazing fluorescent effects under UV light. 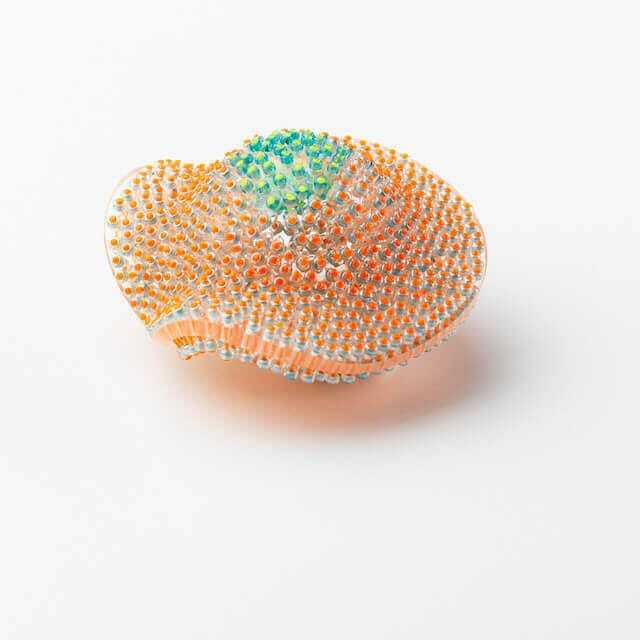 The” Go with the Glow” series brooch is light-weight, tactile, colourful and playful. The nylon wires under UV light create an amazing fluorescent effect and provide a pleasant visual enjoyment for the wearers and viewers. Moreover, the pieces create subtle sounds, following freely with the movements of the body. My jewellery is focused on exploring the multisensory experience and making tactile wearable pieces, which involve different sensory experiences such as vision, sound, and touch. The inspiration for the jewellery series “Go with the Glow” stems from capturing the moving moments in the natural world. I was deeply attracted by free-swimming marine animal. For example jellyfish, which is soft, light, and glowing with the characteristics of amazing colours. I was also fascinated by dancing, rave party and laser light show. I grew up in north-east China. After I finished my undergraduate degree I decided to go abroad for further study. I choose to study a Masters at Edinburgh College of Art because I was attracted by the city; everything is so full of art here. When I graduated the university offered me a position as one of their artists in residence. With my jewellery, I want to create something new and different, a piece of moving art on the body. I hope that in the future my works will feature on, and form a part of, clothing - larger scale wearable art - and to achieve this I hope to collaborate with fashion designers. My jewellery is focused on exploring the multisensory experience and making tactile wearable pieces, which involve different sensory experiences such as vision, sound, and touch. The inspiration for the jewellery series “Go with the Glow” stems from capturing the moving moments in the natural world. I was deeply attracted by free-swimming marine animals. For example the jellyfish, which is soft, light, and glowing with amazing colours. I was also fascinated by dancing, rave parties and laser-light shows. 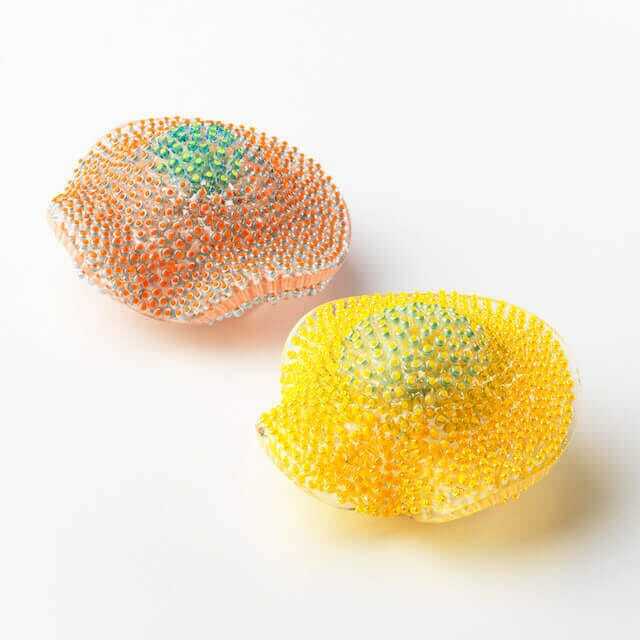 I developed my work by experimenting with acrylic, moving beads, UV reactive nylon wire, UV light and fluorescent paints resulting in light-weighted tactile, colourful and playful pieces. The nylon wires under UV light creates an amazing fluorescent effect and provide a pleasant visual enjoyment for the wearers and viewers. Moreover, the pieces create subtle sounds, following freely with the movements of the body.